John Lennon’s Original Quarrymen – the band who were on stage with John Lennon on Saturday July 6th, 1957 (the day John met Paul McCartney) – got back together in 1997 to celebrate the most momentous meeting in pop music history. They enjoyed themselves so much at that reunion and interest from fans was so great that they decided to re-form the group forty years on! 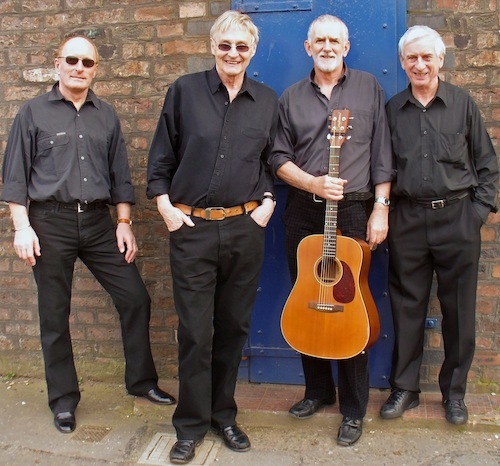 The current Quarrymen lineup includes three of those five original musicians, – Len Garry, former tea-chest bass player, now playing guitar and replacing Lennon as lead singer, – Rod Davis, from Quarry Bank School, at first the banjo player but now on guitar and Colin Hanton on drums, who played with John, Paul, George on the famous 1958 Percy Phillips recording session which produced “In Spite of All the Danger” and “That’ll Be the Day” which was featured on the Beatles’ “Anthology, Volume 1” CD set. On piano is John Duff Lowe who was invited by Paul McCartney to join the group in 1958 and who also played on the Percy Phillips session. As well as their music, the Quarrymen share their Liverpool sense of humour in the stories and anecdotes with which they pepper their performance, giving Beatles fans a unique insight into the origins of their favourite group and the city in which they grew up. Since 1997 the Quarrymen have played all over Europe, in Canada, Japan, Cuba, and Russia, and have visited the USA many times, performing in New York, Chicago, Boston, Las Vegas and across the country. They have appeared on stage with Pete Seeger, Tom Paxton, Tony Sheridan and Laurence Juber and have made countless TV and radio appearances. In 2007 they were featured on the BBC TV’s hour long documentary “It was 50 years ago today” which dealt with the “Day John Met Paul” in Liverpool. In 2010 the Quarrymen undertook a 21 day tour of the US in conjunction with the Lennon biopic “Nowhere Boy” during which they played 17 gigs from coast to coast, culminating in a mammoth concert in New York on what would have been John’s 70th birthday, where guests included Pete Seeger, Tom Paxton and Neil Innes. In 2013 they were featured in the Channel 4 documentary “Rock ‘n’ Roll Britannia”. The only authorised Beatle biographer, Hunter Davies, also wrote the story of the Quarrymen which was published in 2002. The Quarrymen have released two cds, “Get Back Together” in 1997 and “Songs We Remember” in 2004 and in 2009 Horst Fascher’s Star Club-tv released a 60 minute dvd.